On Chicago's busy North side, a small plot of land is seemingly abandoned, returning to nature. The weeds grow high at Jewish Graceland, where only occasionally the noise of Clark Street disturbs the calm. This little graveyard posesses an aura of solitude unsurpassed anywhere in the Lakeview neighborhood. There are no fences between these four cemeteries, and it is difficult to tell where the boundaries originally were. 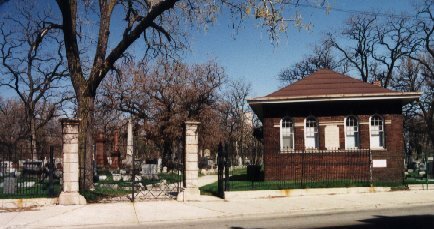 Jewish Graceland sits on Clark Street, a half block south of Irving Park road. Adjoining it to the north is Wunder's Cemetery, only slightly larger. Hebrew Benevolent Society was established in 1851 - making it older than Graceland, Rosehill, Calvary, or Oak Woods. Within the City of Chicago, only Union Ridge and St. John's are older. In recent years, these cemeteries have been poorly kept. Weeds grow high over uneven ground, and monuments lie where they fall. Some monuments have been vandalized, smashed beyond repair.